How Much Life Insurance Cover You Need. No one in the world likes to talk about the death. However, the absolute truth is death. Life is the series of Judgment on changing situations. There is not ‘one size fit all’ cover that will suit all. As the priorities changes and this will affects how much life insurance cover you really need. If some misshapen occurs, not only losing the dear ones, most of the times, families facing serious financial crises. Who will take care of your parent’s health, education of your children and who will take care of your spouse? In such conditions, the Life Insurance is the only friend who can really help. Now the Big Question arises, How Much Life Insurance is enough. · How much money will my family need to pay off all debts? · How much money will my family need to pay off immediate expenditures? · How much money you would like to leave to your family to maintain their standard of living? If you already have Life Insurance: Take all your insurance policies and find out how much life insurance cover you have. Some employers offers insurance cover as part of their employment package, also include this in your total cover. Then ask your self is it enough to secure my families happiness if something wrong occurs. No one can judge better than you can because it is all about your family. Life insurance is need for every one because Life insurance is not investment; it is a product, which protect your family in case of some misshapen occurs. Professionals can only help you calculate the life insurance cover that suits your requirement. Market is full with online insurance offerings. 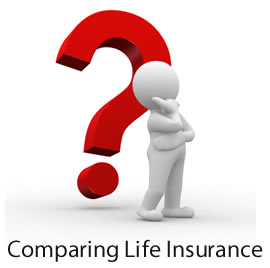 You can compare the online term life insurance premiums and opt the best policy. An online insurance calculator is a great starting point, but you may wish to speak to someone to receive specific personal advice. At Bajaj CapitalInsurance, you can compare the insurance offering s of all the top insurance providers in India, we also provide the clients with free insurance advice over phone. A professional may-be arranged to help you determine which insurance options are better for you.